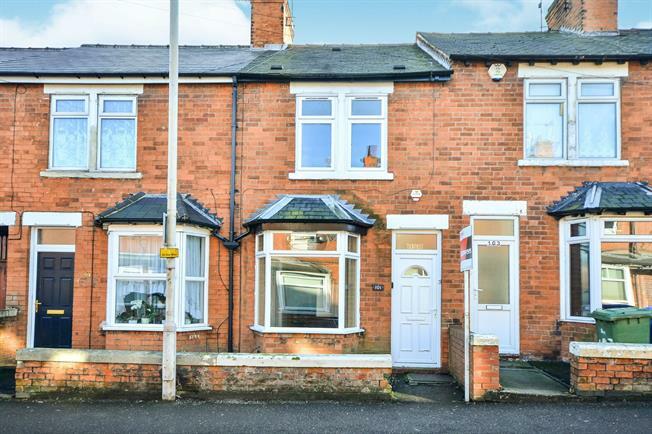 2 Bedroom Terraced House For Sale in Mansfield for Asking Price £70,000. TERRACED HOUSE . . . TWO RECEPTION ROOMS . . . TWO GOOD SIZED BEDROOMS . . . TOWN CENTRE LOCATION. The accommodation comprises lounge, dining room, kitchen and cellar. To the first floor are two good sized bedrooms and the bathroom. Outside of the property are low maintenance gardens. A UPVC door gives access into the lounge with bay window and radiator. With window to the rear, stairs to the first floor and radiator. The kitchen comprises a range of wall and base mounted units with roll top work surfaces over, stainless steel sink with drainer and space for freestanding appliances. There are windows to the side and rear and a UPVC back door. Window to the rear and a radiator. The three piece suite comprises a low level WC, pedestal wash hand basin and a panelled bath. There is a window to the side, radiator and storage cupboard.